Here we have some information about one of the currently-important realms in the Federation-Apocalypse setting, the Crusader Kingdoms. This particular summary is something of a collaboration with Brian Potter; I’ve added a variety of details and additional information to his framework. In the quantum froth of the Manifold, the dreams of men are given form and substance. Some are beautiful beyond description, some terrible beyond belief, and some are simply strange. Many are hauntingly familiar, and often well populated. The ethereal siren call of “what might have been” has bewitched the human mind throughout all the ages of mankind. In their dreams, and with the souls of those few who fell in Core so dreaming, they did so. Like so many realms of the Manifold, for long years the Crusader Kingdoms changed but little: occupied by relatively few souls, and supported in part by historical romances and dusty tomes, there was little reason for it to do so. Then something or someone – what a few mystics who vaguely sensed the interference named the Malumfovea – closed a barrier about the Crusader Kingdoms, entrapped those within, and poured tens of thousand of souls into the realm. And history began again. With such a mass of souls, and the ever-growing population of ensouled children that they produced, the realm grew vital, vibrant with life, change, and growth. From a realm of simple fancy, it became a true “alternate history” realm. Like all realms, the Crusader Kingdoms realm still shows it’s roots in the dreams of the first and later crusades. Here the Crusaders took and held Jerusalem, and still do. Still, things have changed and the Kingdoms have grown. The local Technology has advanced – although not at anything like the pace of Core, where folk cannot call upon priestly power and functioning folk magic to meet their needs. Gunpowder exists, as do rather good flintlock weapons and early percussion-cap models, rifled barrels, and even cannon and explosive shells (albeit as rare objects of wonder) – but without a proper priestly blessing such explosive devices are far more volatile than in Core, for in the Kingdoms you never know when some passing Imp of Satan will strike a spark of unholy fire into unblessed gunpowder. Still, such weapons are – or at least were, before the Horsemen rode – becoming more and more common and the cannon is gradually replacing the counterweight trebuchet. Despite firearms, however, the armored Knight still reigns supreme on the field of battle. In the Manifold, skill, will, and faith are a match for any number of cheap hand-gonnes – and ever-finer steels have kept armor in step with improving weapons, to meet firearms and steel crossbows, there are blessed steel breastplates. Life as a peasant is still hard – but it is more bearable than it was, and not just because of the introduction of distilled spirits. The humble wheelbarrow, better windmills, looms, spinning wheels, and similar devices have lightened the peasants ancient burden, while simple blessings of the fields ensure better crops and prayers help moderate the weather. In the towns there are improved watermills and sawmills, blast furnaces and buttons, paper and block printing, and even mirrors and spectacles. The vague beginnings of a notion of “human rights” has appeared, along with some semi-modern notions of “law”, “justice”, and even “investigation”. Both the middle class and, with the aid of arabic numerals, early compasses, hourglasses, stern-mounted rudders, and better sail designs, the Merchant Princes, are rising. Architectural innovations, such as the rib vault, are allowing the construction of better buildings, oil paints are allowing the durable recording of images, and quarantines and some basic notions of how diseases work are allowing even more people to survive the plagues. While they have kings, princes, and nobles, calling them “Kingdoms” is something of a stretch, as the true political and military power of the realm lies with the Round Table Conference of Jerusalem – a body made up of Knight-Lords (at first 12, now 25) led by the Knight Commander. Council members are chosen by the Council itself from among the Knights who have distinguished themselves in service in some fashion. Neither nobility nor being a major figure of one of the major orders of Knights is a requirement – but it certainly helps, and the Council rarely lacks for a representative of any of the major orders. The Council apportions land every ten years amongst the Knightly Orders in proportion to perceived services and deeds performed by said orders. Sadly, politics creeps into all decision making and not all appointments are as noble as presented. Christian: The Knights Templar (led by Jurin Hans), the Knights Hospitaller, the Christian Knights Teutonic, the Pilgrim Knights, the Orthodox Knights (led by Knight-Lord Amadeus), the Order of the Holy Redeemer, the Michaelenes, the Knights of the Crown, and the Order of Calatrava. Jewish: The Av’ha Solomon (the Society of Soloman), the Abir Shel David (Knights of David, led by Knight-Lord Gilad), and the the Kvut Shofet (the Order of Judges). Muslim: the Brotherhood of the Ribat, the Wind of Allah (Led by Knight-Lord Thawban), and the Al’Batal Min Saladin (the Heroes of Saladin). Zorastrian: The Sadic Jagudar Setare (a priestly order, the “Faithful Magi of the Star”, led by the Arch-Mage Lurstrin Antonidos), and the Monajjem Morsalin (the Order of Astrologers, a very small knightly order specializing in precise intervention). Mithric: the Jamiyat Nargav Tabesh (the Society of the Bull of the Sun) and the Eshrat Rig-Vazife (the Dutiful order of Dust) – although both are very small, and have only a few representatives in all Jerusalem. Stretching from modern day Turkey down to the Suez, the Kingdoms make a great deal of money off of the lucrative trade routes from the east to the Mediterranean. Coupled with the practice of loaning out bands of Knights to various kingdoms and empires in exchange for various monetary and trade considerations, this ensures that the Crusade Kingdoms are well funded, a circumstance that their leaders usually take as proof that the Crusader Kingdoms are indeed favored by God. While the Kingdoms are officially catholic, the population is one of the most diverse in the entire realm. In Jerusalem alone, one can find Catholics, Orthodox Practitioners, Sunnis, Shiites, Jews, Zoroastrians, and even occasional Mithraists and Pagans. Religious tolerance is slowly becoming the norm as opposed to the exception, although religiously-motivated murders are still all too common even without the official sanction of centuries past. Recognized as the Byzantine Empire to outsiders, the Empire is the successor state to the Roman Empire of antiquity. When the victories of the first Crusade defeated the major Muslim powers threatening the Bysantine Empires southern border, the Empire found it had replaced one highly antagonistic neighbor with another one that – while less aggressive – was still not entirely friendly. Fortunately, the penchant for political maneuvering that was to make “Byzantine” a byword for intricate plans and plots for centuries in the Core had not deserted it’s heirs in the Manifold – and the conflicts between the various Knightly Orders of the Crusader Kingdoms offered plenty of opportunities to play them off against each other. Faced with Catholic neighbors to the South and West and Muslim Kingdoms on the Mediterranean, the Patriarchs have worked at reclaiming and conquering territory to the North and East. Now the Empire stretches north to the Baltic and east to the Caspian, while totally engulfing the Black sea. Holy Roman Emperor Charles V reunited Western Europe in a way that had not been seen since Charlemagne. Finding himself in conflict with the Pope, Charles V resorted to sacking Rome and taking the Pope hostage – setting a precedent which has rendered the Pope of Rome largely subservient to the Emperor ever since. Interestingly enough, this breaking of Papal authority has led to a great deal of local independence in the “Roman” Catholic Church – forestalling any major breakups, such as the Core’s Protestant Reformation, by allowing far more local autonomy and removing a great deal of the Catholic Churches landholdings, wealth, and secular power. Since the death of Charles V, the disparate sections of the Empire have been ruled by a selection of princes who elect one of their number as Emperor – giving up some part of their authority in exchange for the support of the Empire against would-be usurpers, revolutionaries, and other troublemakers. Spats with the (Eastern) Roman Empire as to who is truly the “Emperor of the Romans” has led to plenty of petty squabbles and the occasional serious war, but has never really settled anything. Marriage talks between the two Imperial lines have been on-again, off-again, although hope still burns for a return to the great empire of antiquity. Of course, every year, a great number of noble sons join the Knightly Orders and make the journey to Jerusalem. Almost all are second or later children, largely without any inheritance with which to support themselves. While this emigration has reduced the number of idle hands running around to stir trouble within the Empire, it has also led to the strengthening of the Knightly Orders military power thanks to the constant stream of well-trained and well-connected ambitious noble recruits. The Empire finds itself having to use the profits from it’s (unofficial, but vigorous) trade with Avalon and the rest of the Undying Lands to the west to keep the Knights paid off and in line. However, the recent development of better prayers and rituals to make gunpowder easier to make, more stable, and more powerful, may change things by breaking the military stranglehold of the Knight at last. The loosely-allied Muslim Sultanates of North Africa and Arabia are collectively known as “The Dark Kingdoms of the Sun”. Unfortunately, since the Crusade, these nations – preoccupied with infighting between the various sultanates, with internal power struggles within each sultanate, and religious disputes between their various Islamic sects – have been unable to unite effectively enough to dispute the Christian dominance of the Holy Land. Still, some of the kingdoms have built a significant reputation as centers of learning. Major capitols include Carthage, Alexandria, and Baghdad. Far to the east, beyond the lands of the Muslims and the lands known to the Romans, lay the rugged lands and deserts of the Persian Empire. Despite formidable natural defenses, the Persians lost a good deal of territory to the Muslims over the centuries before the Crusade – but the arrival of the Crusaders in the Holy Land granted them a reprieve. While they have been unable to fully expand their borders once again, they have stabilized, fortified, and reinforced them – according to rumor, with both military and strange sorcerous power. Unfortunately, the Persian Empire is surrounded on almost every side by more powerful factions, which they cannot hope to defeat militarily. Their reaction has been to become increasingly insular – and to deploy diplomats in an attempt to focus their various enemies on each other, rather than on a realm that poses little threat. While there have long been rumor that the Zoroastrians have found a source of supernatural power other than the divine or infernal with which to attack their enemies and bolster their troops, the religious leaders of other lands have dismissed such rumors as pagan superstition or mere misinterpretation of priestly power used in an unfamiliar style for just as long – even going so far as accusing the Zoroastrian priests of losing their way and being unable to recognize their own god. The peasants and hedge-magi – who have long used minor magics which, at least appear to be things of nature rather than of the infernal or divine – are not so sure, but the Zoroastrians guard their secrets closely. The Far East: Unknown, believed Pagan. There isn’t much information on the Far East available in the Crusader Kingdoms. In fact, there is reason to believe – if only from the few and perilous routes that allow passage to those lands – that the Far East is, in fact, beyond the proper borders of creation, beyond the World which God has centered on his Holy City of Jerusalem. It is no place for men – although trade with it’s strange inhabitants is every bit as profitable as trade with the Undying Lands to the distant west. The Far North: Unknown, believed Pagan. The icy realms of the distant north are inhabited by a few men – known as violent and courageous warriors – and many monsters. Monks and priests occasionally venture there, but few others; there is little secular profit to be found in a sparsely-inhabited realm of ice. The Far South: Totemism, Shamanism, and Ancestor Worship. The far south – Africa past the Dark Kingdoms of the Sun – is a sparsely-inhabited land. It is said that ancient cults still compete with the worship of Allah in portions of the Dark Kingdoms, and that – beyond the Dark Kingdoms – scattered tribes of shapeshifting beast-men, deadly creatures, venomous vermin, and terrible dragons hold sway. The residents of the Dark Kingdoms may know more, but few reliable reports have come to Jerusalem. 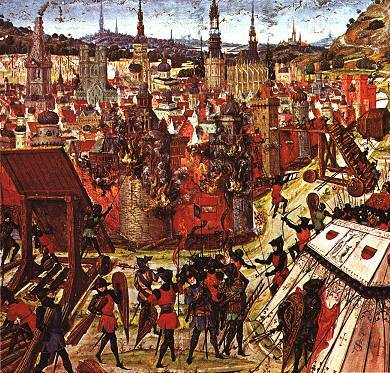 The First – indeed, the ONLY major – Crusade was a grand success for the invading Crusaders. Still, when Charles V attempted to use the Patriarch of Rome to exert an unacceptable level of control over the newly-liberated realm and to exploit it for his own, secular, ends, the major leaders of the Crusade eventually renounced their allegiance to the Holy Roman Empire and staked claims to portions of the Holy Land on the strength of conquest. Untitled noblemen from Western Europe, looking for a chance to make a name for themselves, to gain land, and to stake a claim to power for themselves, began to journey to the new Crusader Kingdoms en masse’. The various Knightly Orders that had sprung up began to fund the journeys of such young noblemen in exchange for vows of service to the Orders. That, coupled with the lucrative trade revenues from routes to the East, gave the Orders a great deal of wealth and military power. Relatively quickly, the various orders of Knights became the most powerful military organizations in the region – soon eclipsing the so-called “Kings” and “Princes” of the Crusader Kingdoms as the brokers of power. The Eastern Roman Empire found that it had replaced a poorly organized but hostile neighbor with a highly organized and ambivalent neighbor – but it was still an improvement. Relations heated up and cooled down on a regular basis, but – for the most part – the border remained stable. A succession of strong emperors led the Empire on a series of campaigns to the North and East, resulting in a resurgence of sorts – and in some major changes in the demographics of the empire. Western Europe went through a rapid series of consolidations as Charles V, heir to the Hapsburg Dynasty, “suddenly” (and by dint of some careful maneuvering) found himself Emperor of the Holy Roman Empire, heir to the Spanish throne, and lord of numerous holdings in Italy, Austria, the Netherlands, and elsewhere. It had been centuries since any one man had held dominion over such a large section of Europe. With so many of France’s younger nobles emigrating to the Holy Land, and the military power of the French nobility thus at a nadir, it was a simple matter for Charles’s forces and mercenary knights – flush with gold from Charles’s sudden near-monopoly on trade with the Undying Lands to the West and reinforced by the Bearsarks of the North – to sweep over France. With the assimilation of France into the resurgent Holy Roman Empire, there were few powers in Europe to oppose Charles V save the Pope of Rome. Unsurprisingly, a dispute arose shortly – and the authority of the Pope proved no match for the secular power of Charles V (despite rumors of his line being afflicted by some hideous bestial curse ever afterwards). With a new Pope – one far more open to ideas from the Emperor – installed in Rome, the Western Roman Empire was rebuilt at last. Today, the dynasty of the Hapsburgs is still going strong, and the borders of the Holy Roman Empire are continuing to expand – even as the Emperors push exploration ever-further, even unto the dangerous borders of the world which are too far from the Holy Land – and Jerusalem, at the Center of the World – to remain stable or suitable habitations for Christian men. At first the eclipse on noon Wednesday May 17, 1697 was taken to be a sign of ill-omen among the peasants. When it repeated on May 24th and lasted several minutes longer, a great number of the nobility and priests began to take serious notice. Each week, the eclipse came and lasted longer than it had on the previous week. By July, the sun no longer shone on Wednesdays – and the days were getting shorter on Tuesdays and Thursdays. That falls harvest was pitiful, as few crops would grow with so little sunlight. Temperatures dropped, rains did not come, and in September, thin snow began to fall across much of the world. Whispers from the north spoke of the “Fimbulvetr”, apocalyptic cults spread, and many came to believe that the day of judgement was near at hand. Famines spread as food stores ran out and the meager harvests failed to replenish them. Rumors of hoarding – whether by farmer, nobles, or merchants only added to the chaos as riots broke out across the land. People started to move to the cities, looking for food and help from the priests. Shortly thereafter, great plagues began to spread, and reports of actual physical appearances by avatars of Plague and Famine – two of the Four Horsemen of the Apocalypse – were heard. People, crops and livestock all died in large numbers. The gathering of the population into the cities only made the issue worse as the diseases spread rampantly. Soon the smoke from mass cremations of the dead blotted out what little sunlight was left. The knights and priests, proving to be far more resistant to the plagues, quickly became the focus of much hatred in the eyes of a populace grasping at straws. Society began to collapse under the strain towards the end of December. With most of the major social and political institutions of the world in disarray trying to cope with the crisis, the Final Army appeared on the eastern frontier. Initial reports of over 200 million horsemen under the direct command of the Avatar of War, while distinctly biblical in proportion, were greatly exaggerated – or were, perhaps, intentionally spread to overawe any possible resistance. Still, it was an undeniable fact that the military force was far greater than the armies which could be rallied to stand against it. Cities, fortresses and major armies were destroyed in a matter of days as the Final Army moved westward. The mightiest of fortresses quickly fell to the overwhelming assaults. Jerusalem itself fell in three days as the defenders were caught unaware and unprepared. As the Final Army moved westward and the survivors tried to pick up the pieces, a new horror began. Amidst reports that Death itself now rode the land incarnate, the bodies of those slain by the Final Army began to rise and hunt for the living. Led by great horrors – the nigh-unstoppable death knights – the armies of the dead began to sweep the land of the living, laying waste to the land and slaying all those who had escaped the Final Army. Military units, ignored or overlooked by the Final Army, began to fight a guerilla war trying to destroy as many dead bodies as possible. More survivors from rural sections of the countryside were found and mobilized. Bodies were burned, supplies gathered, lone death knights slain, and preparations for a stand in Jerusalem began. People, supplies, and weapons were sent to Jerusalem at all haste. Knights fought a retreating guerilla battle, trying to buy as much time before the inevitable siege began. Walls were rebuilt hastily, holy artifacts gathered, alliances made, and concessions were made. The major religions would put aside their differences and unite together under a single banner to try and repel the undead hordes gathering around them. Lead by the newly elected Knight-Commander of Jerusalem, the final defense of humanity in the Holy Land began. As the defense rallied, the weekly eclipse began to disappear – far more rapidly than it had grown. Weather patterns began to return to normal and the worst of the plagues began to die down. New plagues ceased to appear. The Final Army vanished into the west, perhaps to waste it’s time besieging the illusions, shifting lands, and indestructible forces of the Undying Lands. The undead ran out of bodies intact enough to use as new recruits. Reports of the Horsemen of the Apocalypse grew thin, and vanished. It began to look like the defenders might have a chance. Hope began to kindle. Perhaps it was not yet the time of the end, but merely a test, as the flood had been before. This Horseman first appeared early in May of 1697. Foretold an all consuming eclipse that would plunge the earth into everlasting darkness. Reports suggest that Famine appears prior to droughts and other major “natural” disasters.. Attempts to confront or attack him (?) resulted in the would-be heroes quickly being consumed or wasting away to dry and shriveled husks. His presence always foretold a major calamity. This Horseman is a continually coughing man on horseback. Disease and madness spread in his wake and the very earth seems to become blighted in his presence. The first naive attempts to charitably treat his obvious illness only fueled the initial spread of disease among the sick and poor of the cities since his mere touch or presence causes a variety of horrific afflictions – although he is said to have resorted to the use of poisoned weapons against particularly resistant opponents. The Horseman of War appeared in command of the Final Army, the greatest military force which the realm had ever seen. Due to this distinction – as well as to his genial willingness to meet his foes, arrange convenient places of battle, and to ignore non-combatants, more is known about him than about any other of the Four Horseman. War relies purely on his personal martial abilities and on his immense skills in tactics and strategy. He has been observed to wield a sword and shield, a two handed sword, and to dual-wield two swords, switching smoothly as the situation around him changes. He has even been known to compliment and spare those that show exceptional skill or valor on the field of battle, where he likes to command directly from the front lines. He is known to relish a challenge – whether personal or tactical – and will often wait a bit for his opponents to make battle preparations before attacking. Unfortunately, he has yet to be defeated in either personal or general battle within the borders of the world – although he has fairly often been escaped or evaded entirely. The Knight-Commander of Jerusalem is one of the few to have meet War in battle and escaped with his life. This terrible entity leaves only death in his wake. His very presence is said to make life in his vicinity wither and die. The recently deceased rise in his presence and come back as ghouls, zombies or skeletal minions serving only his will. He is said to create death knights by handing out Runeblades to those captured knights deemed “worthy” in his eyes. His attacks are said to be able to rip out the very soul of the victim and use it to fuel his hunger for life. Presumably the first reference to Jerusalem is in error, and should be another city instead, yes? What’s going on there is that the “Final Army” was large, well-trained, and well-equipped – but it was an army of many millions of living men. It overran Jerusalem with ease. In it’s wake, the dead began to rise to hunt down the survivors and the units which had been too small to merit the attention of the Final Army. Jerusalem, even if it was badly damaged and almost depopulated, was still built upon the holiest ground in the world – and so was one of the few places where the undead were at a massive disadvantage. On top of that, slow communications, and the fact that many folk felt that the apocalypse had come, and wished to appeal to god from his sacred city, meant that rather a lot of people were headed for Jerusalem long before the news that it had been overrun reached them. So the walls were rebuilt, rubble cleared, and supplies gathered. Thus, as was foretold, in the final days a new Jerusalem arose, and the people gathered to it from all the lands of the earth.